And I am so relieved. For the past 18 months or so, helping create a new website for Custom PC has been something of an obsession for me. I’ve talked endlessly about it on flights, in bars, in many, many meetings and bored the Jesteress to tears with all my ideas and frustrations. I’ve scribbled brainwaves in notebooks and written thousands of words to try and get the ball rolling and convince people/the company that what Custom PC needed was a really, truly, good website – and that what this would entail would be a very different site, organisation and approach to the one we already had. website should not work if you print it out or disconnect it. (depending on the project) and the same overall quality – but, crucially, this all needs to find a different form of expression in print and on the web. The DNA needs to create two seperate, independent, unique characters. Brother and sister, rather than two clones. the hub of a techy community. With our new site, I think we’re starting to get towards this nirvana: it’s all written by the same team as the magazine, it has both articles from the mag plus web-specific stuff (particularly the news, which my colleague Ben is doing a great job with), lots of RSS feeds, sensible URLs for ease-of-use, plus WordPress-powered blogs for both staff and readers, complete with file space, so you can chuck up your pictures, benchmarks, CPU-Z screenies and mod shots and not worry about hosting. The next big upgrade will come when we start writing our copy using a database and then we’ll be able to do very smart things with benchmark data and tech specs. This is just one of the improvements scheduled to be added – we tinker with the magazine every issue, trying new things, improving it, honing it, and now that we’ve rebalanced the editorial team so that we all work across print and web, this should also be the case with the website. In terms of inspirations, personally, this post by Information Architects Japan was what convinced me of the need for ‘big, clear text’ (although IA probably wouldn’t like the bright colours of the rest of our design), while the excellent Journerdism provided a constant stream of challenging, thought provoking discussions on the way print media was working (or not) online. Wordblog, Modern Life, Publishing 2.0 and MagCulture have all given me great ideas, too. The editorial team and the project team at Dennis Interactive (DI) has worked really hard on making the site happen. The project has been a huge learning curve, because not only has it involved a lot of technical engineering for the coders and designers of DI, it’s also required a re-engineering and re-balancing of how editorial and interactive work together, and a reassessment of many, many aspects of the company’s old approach to the web. There is still a long way to go, but the new site is a good first step. And, so without further ado, here it is. www.custompc.co.uk. 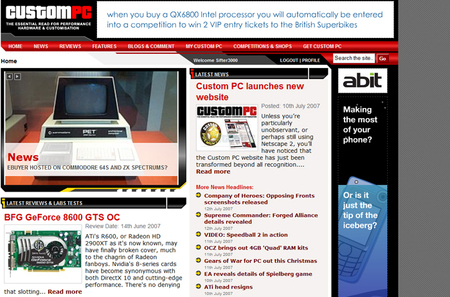 I now have a work blog, www.custompc.co.uk/blogs/alexwatson, and if you want to subscribe to it the RSS feed is here. Also, the Media Guardian has written up the site launch. This entry was posted in Digital Products, In My Life, On Journalism and Media, Tech. Bookmark the permalink. Well congratulations on the accomplishment! I think it’s fair to say it needed this new vision, already taken a quick browse of the content and it’s looking very promising indeed. So well done to you sir, and the other dedicated members of CPC and DI who’ve brought this all together.